Stay informed on upcoming Central Boiler events, news and special promotions. See the latest enhancements and features of the Classic Edge, the Ultimate Wood Heat. Watch testimonials and reviews of Central Boiler outdoor furnace owners. Central Boiler outdoor furnaces burn wood to heat water that is circulated through insulated pipes. Water can transfer its heat by direct circulation or by moving through one or more heat exchangers, or both. Of course, your situation is unique, so it’s important you talk to a Central Boiler dealer to make sure you select the right model for your application. More than just a controller, the FireStar Combustion Controller features built-in wireless connectivity, giving you the ability to communicate with the furnace without additional equipment or cumbersome ethernet cables. Stay connected to the furnace that saves you money on your heating bills from anywhere in the world. You can even receive reminders from your furnace such as when it's time to add wood. With features and enhancements available on no other outdoor furnace, the Classic Edge Titanium HD Series is the ultimate way to heat your home, domestic water and more with wood. The Classic Edge is easy to operate and maintain. Models to match many installation scenarios are available. 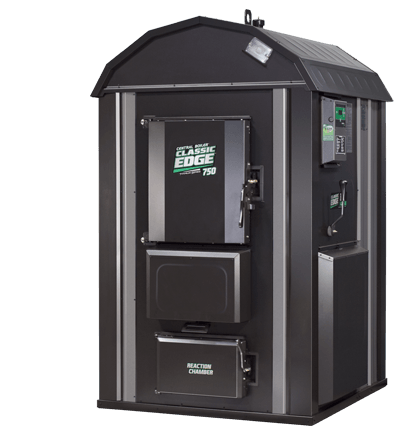 For a list of the Features and Benefits of a Classic Edge Titanium HD Series outdoor wood furnace, and for specifications of individual models, click the Classic Edge Models button. The E-Classic is certified and leads the industry in performance and features. With thousands in operation across the country, the E-Classic has been saving families countless dollars on their heating bills for years. 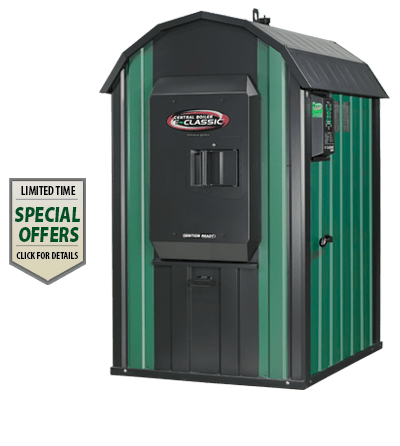 If you're looking for an outdoor furnace packed with features, be sure to take a look at what an E-Classic has to offer. For a list of the Features and Benefits of an E-Classic outdoor wood furnace, and for specifications of individual models, click the E-Classic Models button. 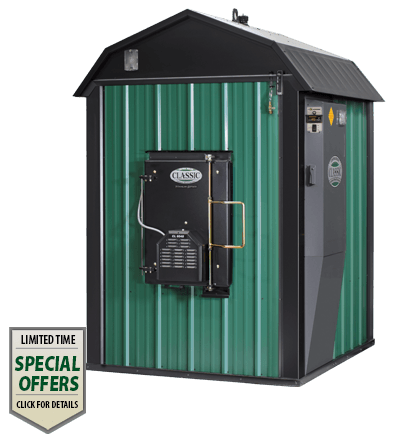 As the outdoor wood furnace that set the standard for quality and revolutionized the industry, the Classic is the perfect choice for heating your business, shop, barn and more. The Classic outdoor wood furnace long ago set the standard for quality and performance, and revolutionized the outdoor wood furnace. With the implementation of the EPA's New Source Performance Standards, in the U.S., Classic models are for non-residential applications only. For a list of the Features and Benefits of a Classic outdoor wood furnace, and for specifications of individual models, click the Classic Models button. For a list of the Features and Benefits of a Forge outdoor coal furnace, and for specifications of individual models, click the Forge Models button. Do you currently heat with an indoor pellet or corn furnace? Would you like to have the convenience of being able to load your furnace once every few days rather than every few hours? 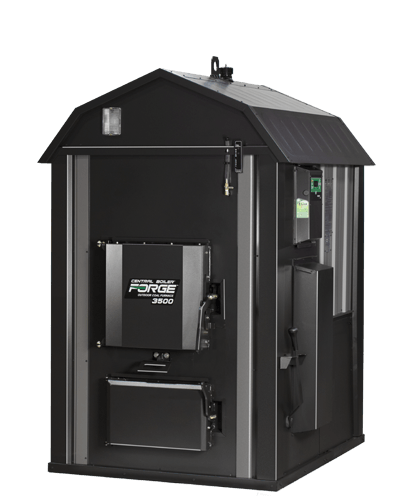 With a Maxim outdoor wood pellet and corn furnace, the furnace is outside which keeps the mess and any dangers associated with indoor burning away from your home. You can heat your entire home and more and have to fill the furnace less than an indoor stove. 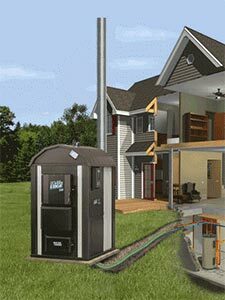 The Maxim outdoor wood pellet and corn furnace can be installed safely outdoors next to your home. 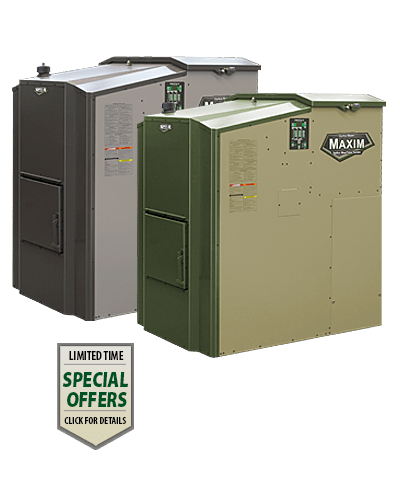 For a list of the Features and Benefits of a Maxim outdoor wood pellet and corn furnace, and for specifications, click the Maxim Models button. This is going into our 3rd season using the Classic Edge 550. Amazed how little wood throughout the burning season this unit uses, power bill has been cut in 1/2. Stove maintenance is low, little cleaning involved. 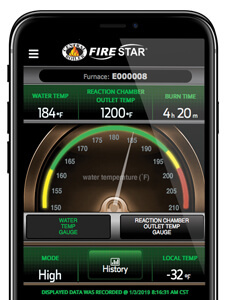 Using the FireStar WiFi module to monitor burn-time and stove efficiency from my phone. Wouldn't own a stove without this, you know when to add wood, no guessing!